Getting a loan is one of the more common things that people do when looking to make a large purchase. Buying a house and a car will often require you to get a loan since it is very expensive to purchase it without any financing. When looking to keep track of a loan and make calculations for one you will want to use a template on Excel. An Excel template will give you the ability to keep track of things such as the principal balance and the interest rate for cars and homes. With this template you will have an efficient way of determining the total cost of thee big ticket items. 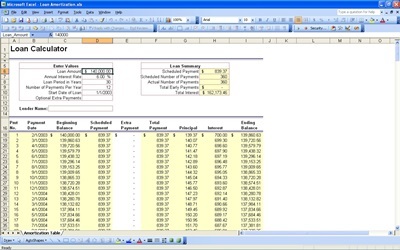 The first part of the Excel template when calculating a loan is the principal balance. This is the amount of money you need to pay in relation to the loan. It is simply the original amount of money you need to pay back over time. However this will be added on with interest but it is a good idea to know how much the principal balance will be so that you can determine if a car loan or home loan is affordable for you. If you are looking to calculate a loan with an Excel template then you will want to go over the principal balance. Another part of the loan calculations is the interest rate. This is a percentage that is added to the principal balance. The interest rate usually ranges form 4% to 18% depending on the person’s credit rating. Going over the interest rate on the template will give you a good idea of how much you will need to pay for a loan on top of the principal balance. By calculating the interest rate you will have the means to efficiently know how much money you will need to pay in order to afford a home or a car. Thanks for making this available. Great tool!